← Post Cards From The Heart – Bessie And Florence? 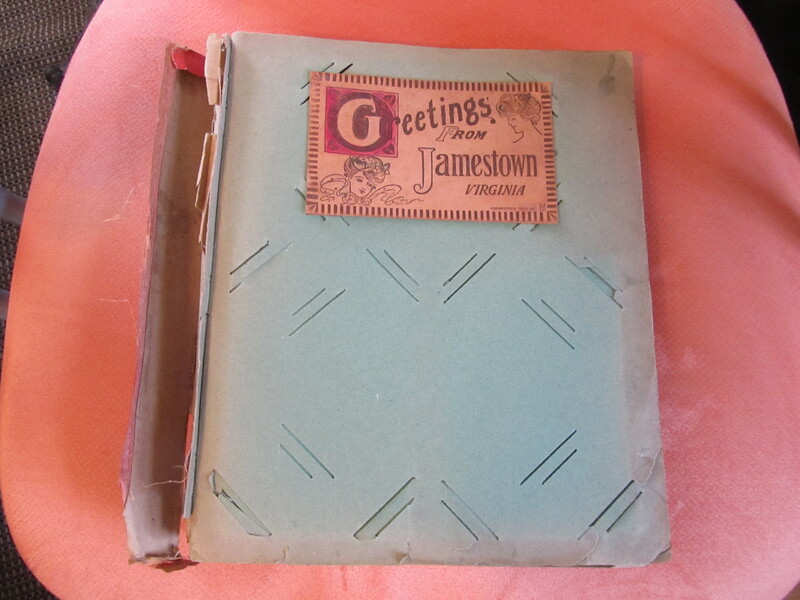 The leather post card on the front of the tattered photo album should have been a clue indicating the significance of the Jamestown Exposition in the life of Bessie and Luke, but it took me several days of pouring through the photos to figure it out. Duh. 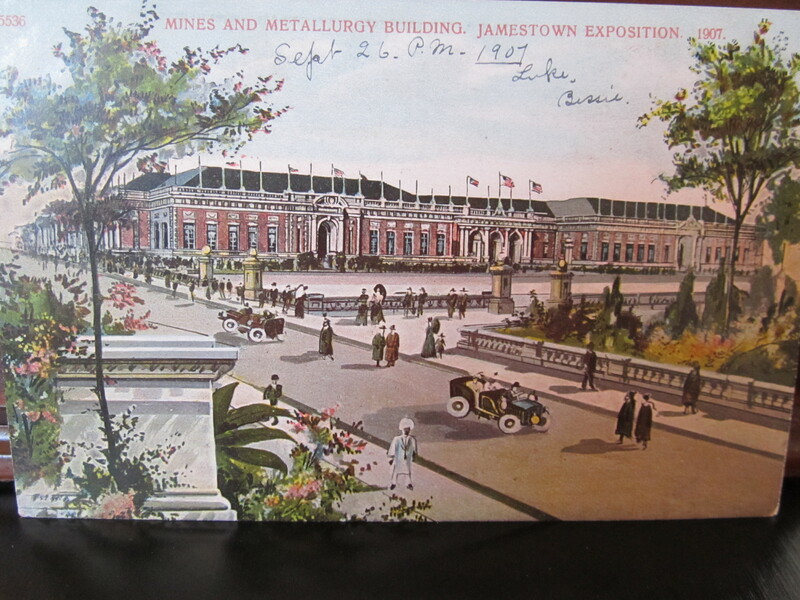 The Jamestown Exposition was held from April 26 to December 1, 1907 at Sewell’s Point in Norfolk, Virginia. 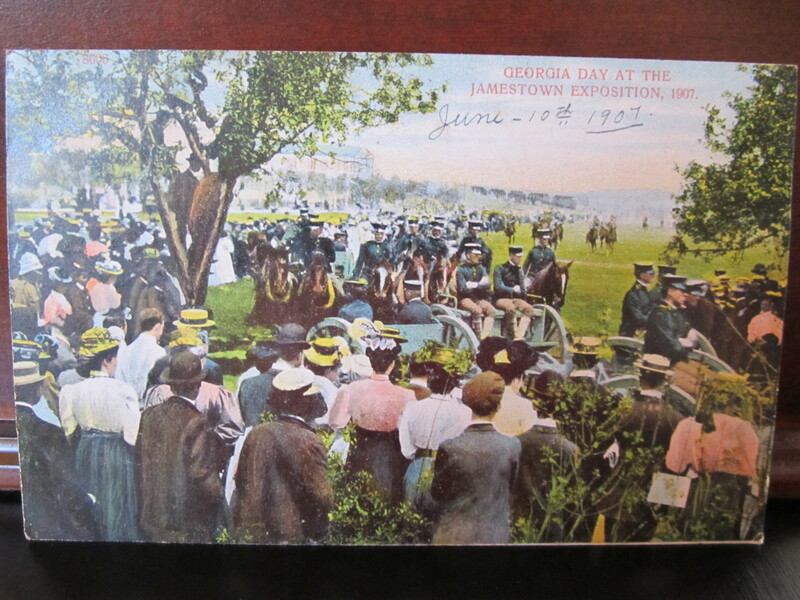 It was one of many expositions popular at the turn of the twentieth century and was a celebration of the 300-year anniversary of the initial landing in Virginia by the English colonists. Unfortunately, it was a financial disaster for its supporters and a cultural disappointment tainted with racial conflicts. Attendance eventually reached 3 million visitors and included President Theodore Roosevelt and Mark Twain who came as a replacement for former President Grover Cleveland as a guest of honor on Robert Fulton Day. President Roosevelt spoke on Georgia Day, June 10, 1907, on the steps of the Georgia Building. Although Bessie purchased a post card marking that historic event at the Exposition, she didn’t arrive until three months later. In spite of the negative press and rumors surrounding the Jamestown Exposition, Luke and Bessie chose it for the first stop of their honeymoon trip. The wedding date remains a mystery, but this trip is certainly the honeymoon. More than 100 post cards in her album describe the trip of her lifetime. Luke and Bessie, she wrote on almost every one of the cards that she used to carefully preserve her memories of the adventure. September 26, 1907…the first day. 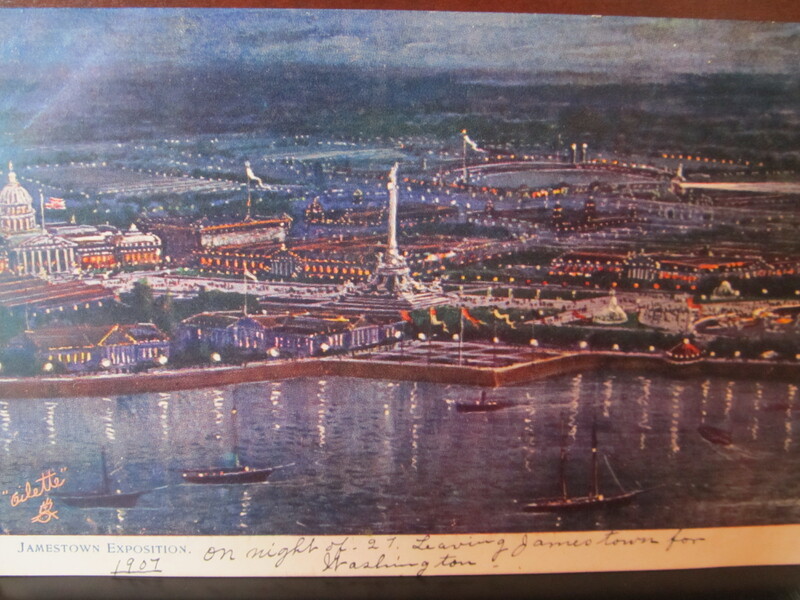 The displays of two squadrons of ships remained one of the most popular sites throughout the Exposition and Bessie bought several post cards of the remarkable water exhibits to remind her of the sight. The displays influenced a number of important visitors from Washington, D.C., too, and probably led to the formation of a naval base in Norfolk ten years after the close of the Exposition. A choice which surely was Luke’s was the Mines and Metallurgy Building. Since he worked for Atlanta Steel, he would want to visit this exhibit and Bessie bought a card for him. A totally unexpected surprise of the trip was the chance meeting of a young man from Canton, New York. No mention is made of how the meeting took place. Perhaps they met at a concession stand having lunch? Regardless, we learn much about him from his post cards. His name was Wm. J. Heckles and he would maintain a friendship through their post card correspondence for many years with the newlyweds from the South. 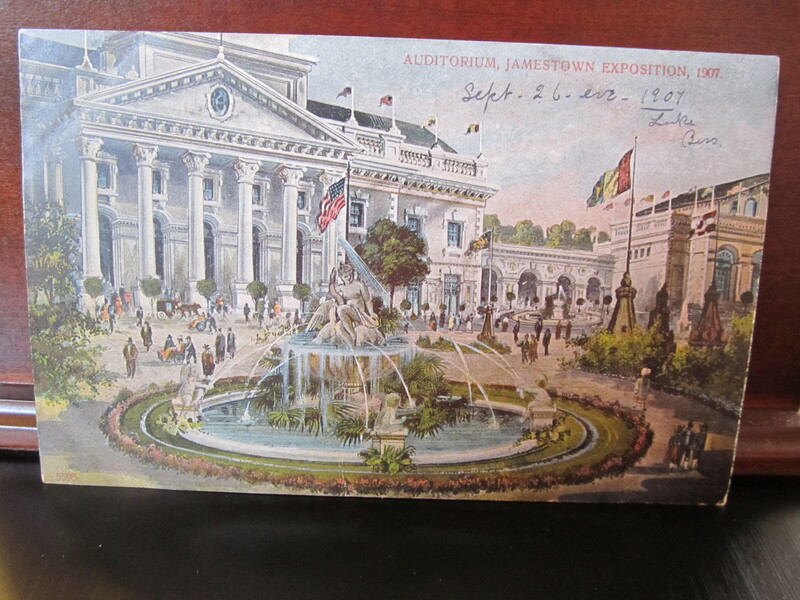 His first post card was sent a month after their encounter at the Exposition. My dear Mr & Mrs Moore, I have at last reached home tired out but well pleased with my trip…Hope you had a fine trip home and reached there all right. I only stayed one day at Jamestown and stayed the rest of the time in Philadelphia and New York. Hoping to hear from you I remain in F.L. & T. Wm. J. Heckles, Canton, N.Y. What’s this? 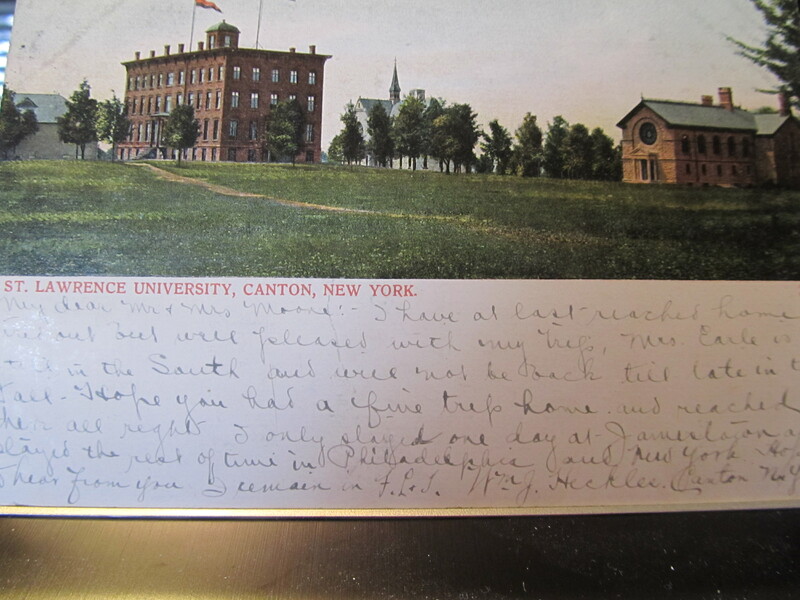 Texting on post cards a hundred years ago? Every one of his post cards through the years closed with F.L. & T. LOL. I have no idea what he meant. 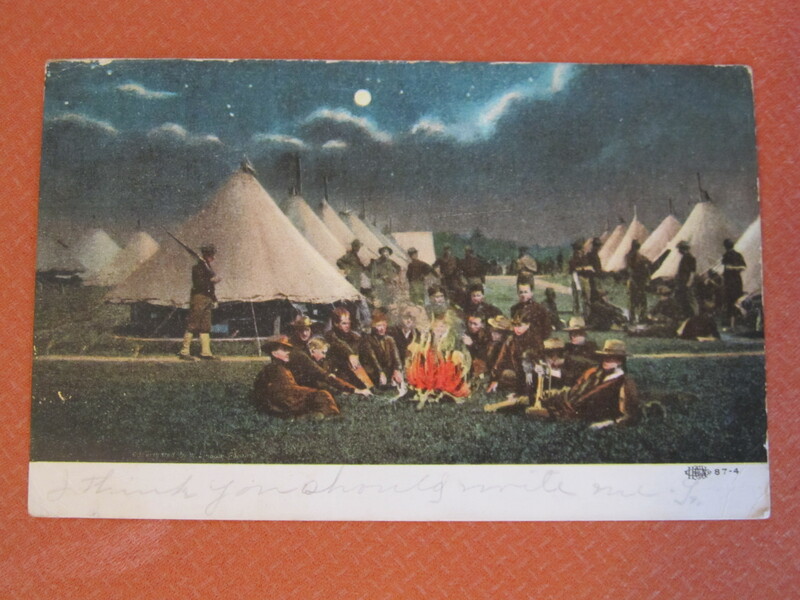 Another post card was sent while the Moores honeymooned. Bessie wouldn’t receive it until she got home, but it came from China, Texas. I think you should write me, F Clearly, Florence from our last post was feeling left out. 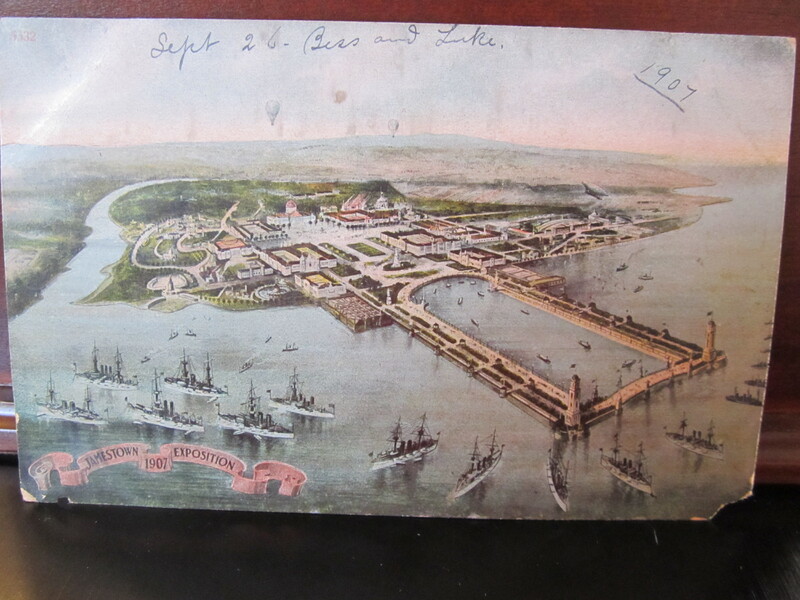 The Jamestown leg of the trip lasted two days and Bessie saved this post card to mark her last day there. Bessie and Luke continue their journey to Washington, and we’ll meet them there next time. This entry was posted in Life, Personal, Random, Reflections, Slice of Life, The Way Life Is and tagged life in the early 1900s, penny cost cards from the early 1900s, picture post cards. Bookmark the permalink. Love these old postcards/photos. You’ve struck a gold mine. Thanks so much, Bob – I love them, too…they have been like buried treasure to me!